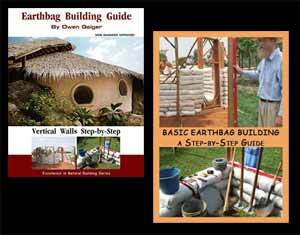 Spiral 2 is a variation of my first spiral house – Spiral House. This unique, almost Hobbit-like earth-sheltered spiral design includes a large grow bed, exposed timber ceiling and living roof. Ample light is provided by the window wall next to the grow bed, window and door glazing, and suntubes. Distinguishing features include two bedrooms, masonry two-way fireplace, covered porch and cool pantry for storage of food (no electricity required for refrigeration). An alternate roof plan is available for building with TJIs where wood poles are not available. There’s even a door planned in for future expansion. This home meets zero energy standards. 740 sq. ft. interior, 2 bedroom, 1 bath; footprint: 31′ x 40′ plus buttresses and covered porch. 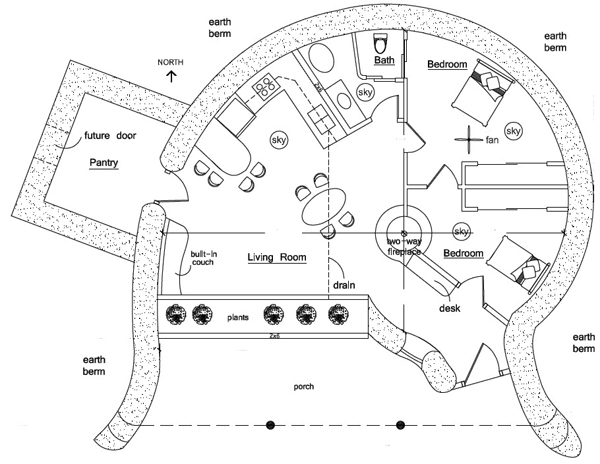 This Spiral 2 house design is interesting. My question is concerning the roof structure and if you have pictures or diagram illustrating same. I have conventional house building experience but I am now retired and would be building completely on my own.Thus I am concerned about roof design. Yes, there is a roof detail drawing that shows the basic construction. You’d need timbers of various lengths and enough workers to move them into position.